President Trump's trade team is getting tougher on Canada. In a decision opposed by some Republicans, the Commerce Department late Tuesday applied tariffs as high as 10% to Canadian paper. This follows American tariffs of up to 18% on Canadian lumber, imposed last year. Commerce Secretary Wilbur Ross says Canadian paper companies get subsidies from their national government and it's unfair to American competitors. In 2016, imports of Canadian paper totaled $1.3 billion. The timing of the move is sensitive. Leaders from the United States, Canada and Mexico start the next round of talks on NAFTA, the three-nation trade pact, on January 23 in Montreal. Five rounds of talks have yielded no progress on divisive issues such as car manufacturing. 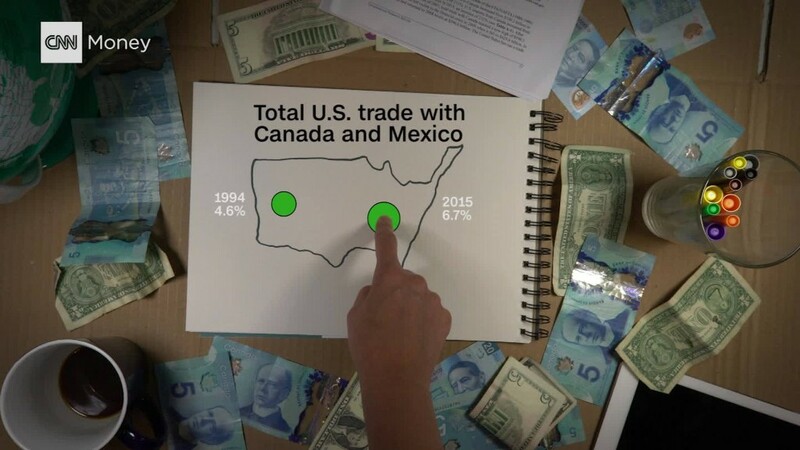 Trump made NAFTA a punching bag during his 2016 campaign. He promised to renegotiate it and bring jobs back from Mexico or withdraw from the 24-year-old agreement. Canadian Foreign Affairs Minister Chrystia Freeland called the U.S. action "unfair and unwarranted," and said the paper tariffs will cost American jobs. U.S. congressional leaders had voiced strong opposition to any duties against Canadian paper, which they argue helps support 600,000 American jobs in newspaper publishing and commercial printing. Eight senators, including Republicans Lindsey Graham and Susan Collins, urged Ross and U.S. Trade Representative Robert Lighthizer to look closely at how the tariffs could affect "hundreds of thousands of Americans jobs." Seven Republicans signed the letter along with Senator Angus King, an independent from Maine. What's unusual about the paper tariff is that one small company in Washington state, Northern Pacific Paper, pushed for it. It employs 260 workers at its mill and is owned by the New York hedge fund One Rock Capital, which did not respond to CNNMoney's request for comment. Resolute, a Canadian company that employs 2,500 Americans and will be hit by both the lumber and paper tariffs, called the Trump administration's decision "outrageous." "This is an effort to perversely manipulate trade laws," Seth Kursman, Resolute's spokesman told CNNMoney on Wednesday. Resolute has headquarters in Montreal and also employs 5,500 Canadians. Kursman would not speculate whether the tariffs would cost the company jobs. Catalyst, another Canadian paper firm, called the tariffs an "unwarranted trade action." It has 1,200 Canadian employees and 1,400 U.S. employees. Other Canadian companies did not immediately respond to requests for comment. According to Resolute, 90% of the newsprint in the American Northeast and Midwest -- the paper that newspapers are printed on -- is supplied by companies in the Canadian provinces of Ontario and Quebec. The company argues that the tariffs won't translate into more business for Northern Pacific but will only hasten companies' transition to digital. The Mississippi Press Association, which represents small- and medium-sized newspapers, warned one of its home state senators, Republican Thad Cochran, about the tariffs. In a December letter, the association's members said that the tariffs would "have a severe, negative impact on the newspaper industry, and ironically, threaten more jobs in the U.S. than the jobs the petitions claim to protect." Cochran did not sign the letter that Republican senators sent to Ross at the Commerce Department. Through a spokesperson, he said he shares the concerns of both the forestry and publishing industries in Mississippi. An aide from his office told CNNMoney that Cochran supports the views expressed by other Republicans who wrote the letter. --CNN's Paula Newton contributed to this report.